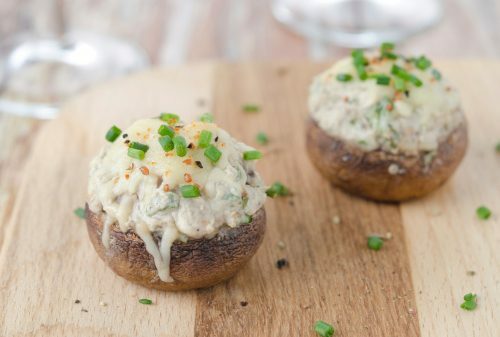 Stuffed mushrooms are a party pleaser, but traditional versions are often full of fat and short on nutrition. This healthy recipe is different, using green vegetables and low fat feta cheese. Arrange the mushrooms, hollow side up, on a rimmed broiler pan. In a large sautée pan, heat the olive oil over medium heat. Add the garlic, onion and green bell pepper, cook until soft and place in a large bowl. Stir in the shredded spinach, white wine, egg and feta cheese. Mound 1 to 2 tablespoons of the mixture into each mushroom cap, using more of less depending on the size of the mushroom. Bake in the oven at 350 degrees Fahrenheit for 20 to 25 minutes or until stuffing is browned and mushrooms are soft.